Dermal Therapy™ Very Dry Skin Lotion provides optimum hydration and protection for your skin. Dermal Therapy Very Dry Skin Lotion contains 10% Urea and 1% Dimethicone in a synergistic blend of emollients and skin conditioning agents. Very Dry Skin Lotion provides optimum hydration and protection for your skin. It is suitable for use on very dry and itchy skin such as Winter Itch, Ichthyosis, Eczema, Psoriasis, Dermatitis or other dermatological conditions. It is a non-greasy formula which is suitable to use on the whole body. A light pumpable lotion, it’s suitable to use as a maintenance product after using Dermal Therapy Very Dry Skin Cream. Dermal Therapy Very Dry Skin Lotion is suitable for the whole family as an everyday body lotion. Apply all over the body or affected areas as required on a daily basis. Over a 24 hour period, subjects between the ages of 24 to 63 applied Very Dry Skin Lotion to a site area. 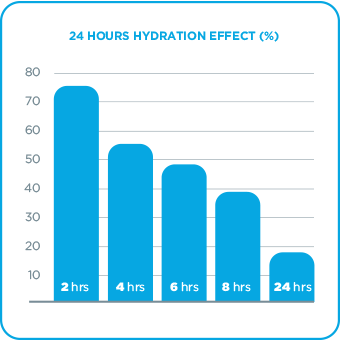 Hydration levels were determined by measuring skin’s electrical resistance. The results showed that after 24 hours of applying a single application of Very Dry Skin Lotion to the site are, the skin was still hydrated. Thank you BH. I received this in full size a 500ml product! Its a large rectangular sized bottle with a blue pump top. One pump gives a generous amount with this scented thick white cream. I have used this on my dry elbows and hands at night and I can feel a nice cooling sensation after I applied it onto the skin. I enjoy the light scent its flowery and fresh. Its non greasy and gentle on the skin. My husband really likes this lotion, he used it on his sunburnt skin that was peeling. It is not so itchy as he has used lots of skin lotions and it is not irritant on his skin. This is a great pump sized product I will definitely get great use out of it as it is a multi tasking product for all over the body! This comes in a large size and I love that it's a pump bottle as it's much easier to use than a moisturiser that has a lid on it. The lotion is not greasy and I'm able to rub it onto my skin easily and it absorbs well leaving my skin feeling soft and smooth. It's great for everyday use and lasts a while. Ideal for anyone who has dry skin and needs a moisture boost.